Donald Trump can tout coal all he wants, but its use as an energy source is headed downward in this country. Here’s more evidence that Donald Trump’s 2016 promises to bring back coal jobs were a sham: A new report from the Trump administration predicts that the amount of coal production in the U.S. will keep dropping in coming years, while the percentage of energy coming from renewable sources will keep growing. 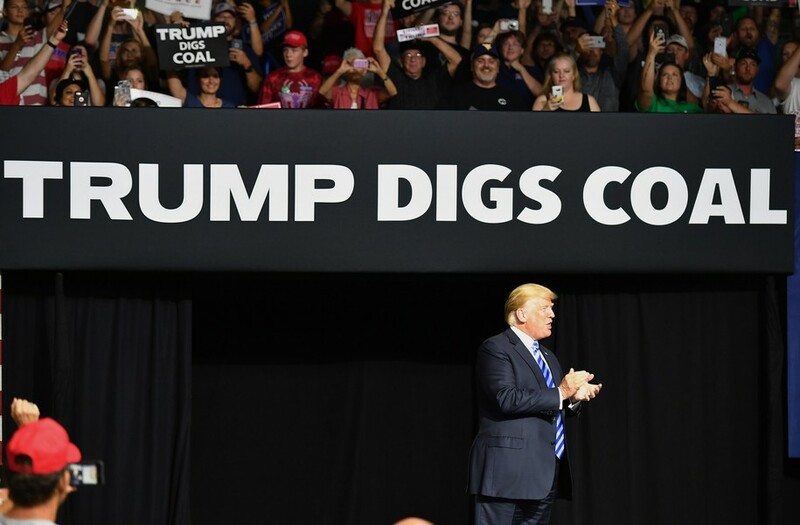 In its monthly report labeled a short-term energy outlook, the U.S. Energy Information Administration cut its projected estimate of coal production in 2019 by 8 percent. In 2020, coal production is expected to drop a further 4.5 percent. “EIA expects declines in both steam coal and metallurgical coal (used in the steel-making process) exports in 2019 and in 2020,” the report said. U.S. coal production in 2019 is expected to be 694.9 million tons, the lowest production since 670.16 million tons were produced in 1978, according to a market insights report from Standard & Poor’s Global. The percentage share of electricity generation in the U.S. from coal also is headed downward: from 27.4 percent in 2018 to projections of 24.7 percent in 2019 and 23.4 percent in 2020. The amount of electricity generated from coal was over 30 percent as recently as 2016. At the same time, power generation from all renewable resources is expected to rise. “Wind, solar, and other nonhydropower renewables together provided about 10% of electricity generation in 2018. EIA expects they will provide 11% in 2019 and 13% in 2020,” the report said. The biggest energy generator in the U.S. remains a fossil fuel — natural gas. As a matter of fact, fossil fuels still make up about two-thirds of all electricity generation in the U.S. When comparing coal and renewables, the changes might be small, but at least they’re going in the right direction. Renewables are the fastest-growing source of electricity production in the U.S.
And all of this is far from enough to fight the effects of climate change. The ongoing price drops in wind and solar power mean that in many areas, building and running new renewables is now cheaper than just running old coal plants. And new renewables have actually become more affordable than new natural gas plants. At least four major coal companies have declared bankruptcy in the past three years, although some merely used a Chapter 11 filing for restructuring purposes. The most recent, Westmoreland Coal Company, is the nation’s oldest coal firm. Its recent court-approved bankruptcy plan also allows it to restructure worker benefits. According to a report by the Sierra Club, Westmoreland had more than $1 billion in debts, and many of its mines already were closing or being sold off. Of course, the effort to save the company wasn’t going to help currently employed or retired coal miners. The irony is that even the mines that Westmoreland’s lenders are using the bankruptcy process to acquire will be worthless in a few years. The Rosebud and San Juan mines each sell coal to a single power-plant buyer, and each of those power plants has announced that it is shutting down. The Rosebud Mine provides coal to the Colstrip plant, which has announced that it will close two of its four units in 2022 and is widely expected to close the remaining units in 2027. The San Juan Generating Station, the sole purchaser of coal from the San Juan Mine, already closed two of its four units in 2017, and is on track to shut down completely in 2022. Westmoreland’s bankruptcy further demonstrates that thermal coal production is no longer an economically viable or sustainable industry by highlighting the cruel measures the company is willing to take to minimize costs. In its filings, Westmoreland has described its obligations for employee health and safety, the environmental reclamation of its mines, and the restoration of polluted waterways as “burdensome regulations.” The company has now begun using the bankruptcy process to try to strip away those obligations. Specifically, it’s indicated its willingness to force renegotiation of collective bargaining agreements and pension and retiree health benefits. And it has announced its intention to default on its pension, healthcare, and black lung obligations. We don’t expect much from the coal industry, but renewable energy is another story. While Trump’s misguided tariffs on solar cells and modules dampened growth in solar energy, even causing a slight decrease from 2017, there is still projected growth in years ahead: Fourteen percent growth is predicted in 2019 compared with 2018. And total photovoltaic capacity in the U.S. is projected to double in the next five years. Those interested in tapping that growth better hurry: The solar investment tax credit, which allows businesses and homeowners to deduct 30 percent of the cost of installing a solar energy system from federal taxes, is slated to expire in 2021. There’s also a tiny ray of hope in the EIA report about a projected drop in greenhouse gas emissions, but there’s reason to be skeptical. After rising by 2.9% in 2018, EIA forecasts that U.S. energy-related carbon dioxide (CO2) emissions will decline by 1.6% in 2019 and by 0.5% in 2020. The 2018 increase largely reflected increased weather-related natural gas use because of additional heating needs during a colder winter and for higher electric generation to support more summer cooling use than in 2017. EIA expects emissions to fall in 2019 and in 2020 because of forecasted temperatures that will return to near normal and natural gas and renewables making up a higher share of electricity generation. Energy-related CO2 emissions are sensitive to changes in weather, economic growth, energy prices, and fuel mix. It’s pretty disingenuous to make predictions about energy use, given that much of the country just went through bitter cold during a polar vortex, using a lot of natural gas to heat homes, and heat waves last summer, driving up the need for air conditioning. Although 2018 was the fourth hottest year on record, it only received that rank because the three prior years were even hotter. What’s to say we won’t hit record heat again in 2019? Even if this drop in the bucket about a slight downturn in greenhouse gas emissions turns out to be true, it won’t make much difference in the long run. Not when we’ve got only a 12-year window to make the massive changes needed to limit global warming before it’s too late. Originally posted on Daily Kos on March 17, 2019. ← Students are leading a worldwide climate strike on March 15. Grown-ups, take note.